Nik, a college dropout, joins Roy & Grant Communications, a passionately charged advertising agency, with enthusiastic anticipation, only to discover that his life is about to change forever. He bumps into Ratty, the love rat; and Su, the benevolent prude, instinctively perceiving that there's a cosmic connection between the three! They become the best of friends. Soon, they are inseparable. 3 more team up with them to form a batty group that lives up to the advertising world's reputation of being totally demented. But they hardly care. They're having way too much fun, together! Just when they hope that their merry little world continues, life reveals a new plan. Nik commits the cardinal sin of falling in love with one of his best friends. Before he can declare it, he learns that Su is in love too, but not with him! When the bombshell Mallika arrives on the scene, the skirt-chasing love rat finds himself in love too! 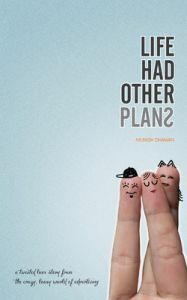 'Life Had Other Plans' is part funny, part loony, part tragic tale where nothing goes according to plan. It's high drama of love gained and love lost that builds up to a completely unexpected end. but not before the three protagonists - Nik, Ratty and Su are forced to confront their deepest, darkest secrets! Born and brought up in Amritsar, and polished in Calcutta, where he met his sweetheart and now wife of 17 years, Munish stepped into the advertising world as a copywriter, after almost failing B.Com. 20 years later, he’s still at it, writing advertising for many national and international brands, and enjoying it to the hilt! Munish has won many advertising awards, is a fitness buff, jogging 8 km at least 5 days a week, and is an ardent fan of Single Malt whiskies. He works out of Gurgaon and lives in Delhi with his banker-turned entrepreneur wife and fourteen year old son.